The first step in meal planning is gaining some experience in cooking and knowing what your skill level is to pick out recipes. A reasonable goal is to try one new recipe a week. Some of them won’t work out, some you will want to share. I needed to eat an organic, hypo-allergenic diet (as if teaching yourself how to cook normally isn’t a challenge without restrictions). I also wanted to eat seasonally and local when I could so that it was fresh and better for the environment. When I started this process (about 10 months ago) , I didn’t really know how to cook or bake anything. I had to start looking at cookbooks, magazines, blogs, and watch cooking shows. I have a preference to homemade, natural ingredients, vegan, herbs, easy, unusual and pretty to look at as well as eat. Things that are really tasty, something a meat eater wouldn’t mind sharing even though it is vegan/vegetarian. I really wanted interesting combinations with lots of color. I mean, eating avocados all the time can get ho hum even if they are delicious. Unless I wanted to keep eating unfulfilling salads or plain rice and veggies, I need to start gathering recipes. So, I started my research. I read and watched everything. I learned how to cut up and wash a leek. I learned how to use coconut oil. I discovered a mandolin slicer and an immersion blender. I just started. I watched shows even though I wasn’t interested in that particular dish, but was interested in how they treated a particular ingredient. I just made a Carrot Fennel Soup from Orangette. I never used fennel before. (I admit I bought it twice then ended up composting it after I wimped out waiting to use it.) Well, I watched Mary Ann Esposito on Ciao Italia shave a fennel for a salad a few weeks back. So, that is what I did, shaved and sliced. 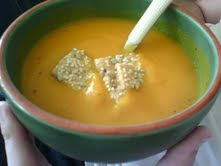 That is the best carrot soup I have made yet! I would post the recipe for you, but I really want you to go read her story about it. I almost felt French enjoying my soup! I have attempted other recipes but never liked them. I wanted a carrot soup, so I kept trying. (Looks like I do not like the full amount of OJ in it.) Blogs have really been a great tool in learning. You can see what worked and didn’t through other people. I have a “Blog- food” bookmark just so I can keep up to date on recipes as the seasons change. I have so many recipe pdf files on my computer that I have arranged by main ingredient. Categorizing by “dinner” wouldn’t work for me. For example, I have a category just for lentils. I specifically wanted to learn how to use them in a bunch of different ways. So, I spent an hour searching, gathered the best and saved them as pdfs. My goal is to try them out. If they work, then I will print them out for future use. I haven’t decided on a final organizational solution for the print out. Right now they are in a stack. Not exactly ideal. But part of my process none the less. I think ideally it would be nice to put them on pretty index cards and use a standard recipe box. But I don’t see me doing that this year. 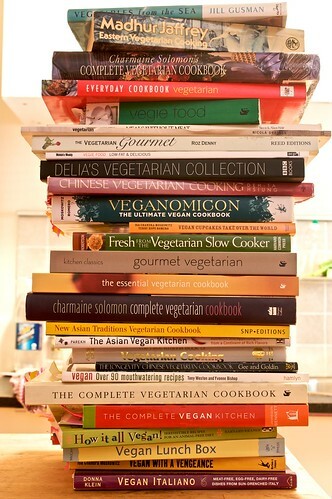 Armed with my growing stack of recipes, I set them out in front of me and see what has similar ingredients. If there are two with leeks, then I try to plan to make those the same week so I use up all of the leeks. More on planning next week. Hope you find a new favorite resource to add to your recipe library! I love to cook, but a couple of years ago, with a busy schedule, I was stuck in a culinary rut. I made a New Year's resolution to make a minimum of two new dishes every month. There are so many resources available these days for recipes, that it was easy to stick to, but best of all, it really expanded my repertoire, and improved my cooking skills! Yes! That is what I am hoping for. I read a book on being french a few summers back. It said that every "french" girl should should keep essentials and be able to whip up an amazing dinner at the last moment. I want to be able to cook without thinking. Soon, I will have a repertoire too. Thanks for sharing! Having a well thought out, well stocked pantry is KEY to cooking at home. Good on you for finding inspiration and for being adventurous in your cooking! My secret weapon for trying new things? Getting a CSA box. That way I get local organic produce, and I have things on hand that I wouldn't normally choose to buy in a store. I LOVE Super Natural Cooking. My other go-to cookbooks are the New Moosewood Cookbook (great for all the basics)and Local Flavors by Deborah Madison (which is about seasonal farmer's market shopping/cooking). Great idea! Ooooh, Local Flavors sounds like a good read. Thanks for the tips! Looks delicious! I'm going to have to try this out soon. Totally Orangette too, I haven't read her blog before.